When On the Willows invited contributors to write about a favorite holiday tradition, I signed up immediately. Then I stared at the wall for several weeks. Our family is still a little new to this holiday tradition thing. Neither my husband nor I brought a stockpile of holiday traditions to our marriage. I’m an only child who grew up many hours away from my extended family; my parents produced festive holidays, but it seems to me that at least one sibling is necessary to create a family culture in which holiday traditions are remembered and carried on. And my husband is the son of first-generation Chinese immigrants; they combined Western Christmas traditions with Chinese cooking, which would be wonderful if either of us could cook like my mother-in-law. It was only four years ago, when our third child was born and we moved to Vermont, that we declared ourselves officially “Home For The Holidays.” Henceforth, we would celebrate Christmas in our home rather than alternating between grandparents; extended family was welcome to come to us. Four years isn’t a long time to develop traditions, especially with three young children and a fourth baby in the mix; we’re mostly just trying to stay afloat through the holidays. We have traditions, of course, but it’s mostly the standard stuff: special foods, family meals, decking the house, picking out and putting up the tree. Over the last five years, we’ve started observing Advent more seriously, lighting candles and reading an Advent reflection each night before Christmas. We’ve even extended our festivities twelve days beyond Christmas to Epiphany, which we celebrate with the traditional Kings’ Cake. 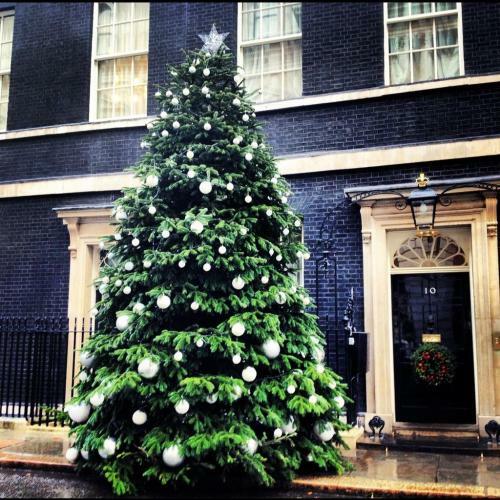 It’s all lovely, but none of our traditions seemed to have anything new to offer. Then, as I was staring at the wall, I realized that I was looking at the one innovative tradition I do have: our card chain. In the almost two decades (gulp!) since our undergraduate days, my husband and I have, between the two of us, attended four graduate schools, held eight jobs, lived in four states, and inhabited eleven homes. That seems crazy, but in this day and age it’s probably not all that unusual. What it means, however, is that we no longer live near the vast majority of people who have been important to us at various points in our lives. In most cases, the only communication we have with these people is through the internet, which is nice but intangible. At Christmastime, our mailbox fills with envelopes from Connecticut, New York, Virginia, California, Kansas, Ohio, Indiana, Colorado, North Carolina, Florida, New Hampshire, Maine, Massachusetts. And in each envelope: a little card with a note, perhaps a picture, from those people whom we now love from afar. There was a time when I felt ambivalent about Christmas cards. They seemed like less environmentally-friendly versions of Facebook: tools for bragging about your life by presenting only the perfect picture, the happy highlights. And collecting them seemed bragg-y, too: Look how many friends I have! A few years back, I concluded that I could look at Christmas cards as bragging tools, or as relationship tools. When I chose the latter, it changed everything; as the cards arrived, I’d tape them where we could see them from our dining room table, so that we — the children and adults in our family — could see the faces and remember the people we rarely saw in person. Sometimes, we’d choose a card and pray for the family or friends who’d sent it. Or we’d tell stories about the time so-and-so did such-and-such. Pictures — actual pictures that you can hold in your hands — are valuable these days. I hardly ever bother to print out the digital pictures of my own children, let alone other friends and family. The thing that felt wrong was tossing all those cards in the recycling bin every January. It was as if I’d betrayed all those beloved faces staring up at me from underneath the discarded paper towel rolls and cracker boxes. So here (finally!) is our tradition: We don’t throw the Christmas cards away. I still tape them up as they arrive in December, but when the last card has come and the holidays have gone, I keep them. I take them down. I cut out the picture from each card and remove any holiday messages — after all, these have to remain relevant all year. Then, I punch a hole in the top of each picture and string them all on a long piece of yarn. 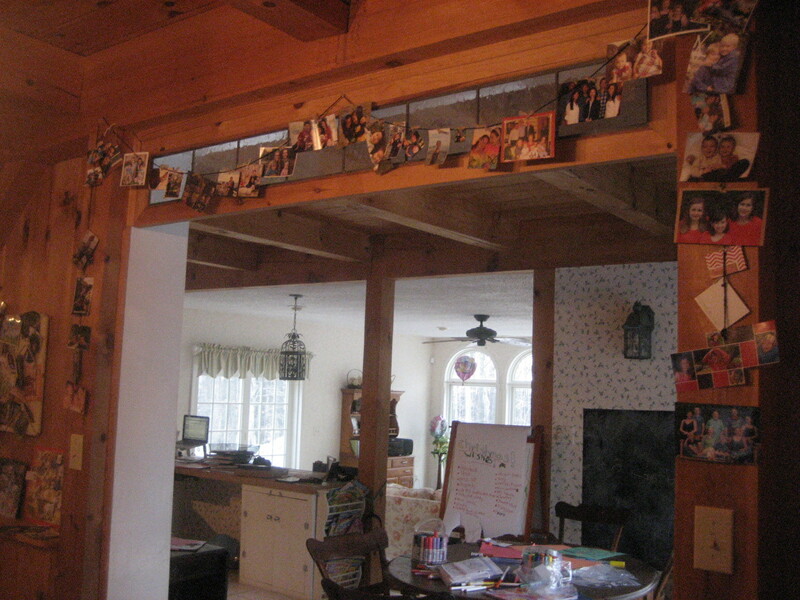 Now, I’ve made a “card chain,” which drapes perfectly around our dining room doorway, where we see it at every meal. The chain stays up all year, until the new crop of cards begins to fill our mailbox. It serves as a decoration, as a reminder, as a prayer guide. It’s a relationship tool: a holiday tradition that truly lasts all year. Christmas morning began presenting itself in “theme” when I was about twelve years old. My parents were never ones to be lacking in the “creativity” department. The morning would be broken into three parts. 1) Sub 6 o’clock- 7am: The morning theme “reveal” and stockings. 2) 7- 7:09 (or as long as we could possibly wait to open gifts under the tree): Breakfast, sometimes in accordance with the theme. 3) 8 o’clock: Tree presents, opened one at a time so that each person would experience the joy of “giving” as well as “receiving”, watching family members open gifts that us kids had hardly kept secret out of pure excitement. Not sure how they decided on this Christmas theme tradition, but it became the grand question over the year . . . what would next year’s theme be? “Mission Impossible” . . . All of the kids were given cassette players (yes, it was the ’90s) with recorded scavenger hunt clues leading us around the house where we had to yell out random things, dance, or “tell your mom how much you love her” before getting the next clue. We all ended up in the kitchen where our new DVD player and movies were hiding in the oven. “Survivor” . . . We had to participate in games and competitions to receive the ultimate gift. Twister at 6am? Yes, really. “Price Is Right” . . . My sister was way too good at this year, as she guessed the price at most of the gift items! There were consolation “gifts” for my brother and I, thankfully. “Vintage Christmas” . . . We strung popcorn and cranberries to hang on the tree, Dad dressed up as Charles Dickens, we made “figgy pudding” (which we all concluded was gross), opened vintage wine with dinner, and were given second-hand family gifts. “Montana” . . . We all wore Montana tourist t-shirts and played “Jeopardy” for cash, answering trivia questions ranging from our Montana family tree to Montana family vacations past. “The Kids Are in Charge” . . . My personal favorite — when the kids informed the parents WELL IN ADVANCE that it was “our turn”. We dressed up in our parents’ clothing, made breakfast, ran them through a string of games they had “put us through” in years past, and THEN took THEM on a scavenger hunt to all the local places where we had taken Christmas card photos and attempted to re-enact them. Every December when I was a little girl my mother and I began THE QUEST. The quest for the perfect Nativity set. The nativity scene had a couple of stipulations: our Mary had to look young, our Christ child couldn’t be blonde, and there had to be three wise men. I’m not sure how these stipulations came into play, but in my childhood home, the Bethlehem scene was a bigger deal than Santa Claus. Everything had to be perfectly exactly right. A lot of time and care went into creating the scene. This allowed us to focus on the real meaning of Christmas: the Arrival of the Messiah that is Jesus, the Christ child. You see, In Colombia, the country my mother is from, Colombians re-create the village of Bethlehem throughout the month of December. Until 1991 Colombia was an officially Catholic country and Christmas in Colombia was clearly a religious holiday. Santa Claus, although heard of, was not as wildly celebrated there back then as it is there now. Even to this day contests are held on who has the best manger scene. People decorate it according to their knowledge of Bethlehem, or they adapt the scene to their location. One can find Bethlehem scenes in very tropical or mountain set ups, as well as on pastures or lakes, the more creative the better! And even though I was raised as a Protestant in the United States, my mother kept this tradition of creating a Bethlehem scene alive. For the first two weeks of December we would scour all of the stores in Philadelphia in search of creatures to add to our scene. Then, about nine days before Christmas, my mother would place the Nativity scene in a central location in our home. The nativity scene included Mary, Joseph, shepherds, angels, villagers, cows, donkeys, sheep, and on December 24th we add the Christ child. The scene stayed put until January 6th, which is Three Kings Day, on this day we would add the wise men and they would remain on the mantle until February. Seems simple enough right? Now I have been living in my own place for four years now, but I’ve kept the tradition alive by creating a Bethlehem scene. Each year I make the town a little different and I host a Bethlehem Party or Fiesta del Pesebre to set up my Bethlehem scene. A Bethlehem Party is a bit like a tree-trimming party, however instead of bringing ornaments or buying a tree to decorate, guests are asked to bring a token or figurine that they can place in the Bethlehem scene that represents themselves on their faith journey. Snacks to eat while creating the Pesebre (this year we will have empanadas, arepas, bunuelos, hot chocolate). Village materials (moss, twigs, or colored construction paper, origami paper, play dough or anything that can be used to create a village scene). A tambourine, bell, or drum to play some live Christmas carols. Something to add to the nativity (Mary, Joseph, a shepherd, wise men, superhero, animal, stars, angels, dolls that could be villagers (like Spiderman, Cinderella). The call for creativity is loud here as size or shape does not matter so long as the item doesn’t promote war (Christmas is a time of celebrating the Prince of Peace) and doesn’t contradict the message of Messiah. Create the terrain first, then place the manger scene at the highest point, or in the center. This reminds us that we should have Christ in the center of our lives, and lift His name high so all can see. Add the villagers. Don’t worry if they aren’t dressed in accurate period attire, or appear to be out of place in Bethlehem. Remember that many will seem out of place in heaven, but He has granted salvation for all who believe in His name. Add the shepherds, animals, and angels. Space them out in the beginning of the month and as December 24th draws closer, bring them closer to the Christ child. Remember Christ draws all to Himself, from the poorest to the wealthiest, from the most profane to the holiest. Add Mary and Joseph, and as the days pass, move them closer to the manger. Remember that God has created us for a purpose, each each play a part in the story. Finally, on December 24th, add Jesus, the Christ child. Tell the little ones how every good gift comes from above, and how Christmas is a time to celebrate the greatest gift of all: Jesus. A Christmas Movie: We get a different one every year so that we can add to our Christmas movie collection. Last year, we did A Muppets Christmas Carol. New Pajamas: All the kids get a new set of pajamas, and it’s fun to keep them in the Christmas theme so that when they wake up the next morning and open presents, it makes for really cute pictures. I usually order these online on Cyber Monday so I get a good deal. Yummy Snacks: We don’t do a lot of sugar or junk food at our house, but for Christmas we make an exception! In our box, we always include kettle corn, candy canes, and another festive treat of some sort to snack on while we cuddle up and watch our movie. Hot Chocolate: This tradition is like the holy sacraments at our house. Hot chocolate with little marshmallows is a must! The Night Before Christmas Book: We read the same one every year. I pack it away with our Christmas stuff and then wrap it up in the Christmas box. After we’ve watched our movie and filled our bellies with treats, we set out cookies and milk for Santa and throw blankets and pillows down in front of the tree to read “the book”. Finding new traditions as we leave the families we grew up with and begin building our own is something that has comforted me being away from family during some holidays. Even better are the traditions you had growing up that you can pass down to your own children. This has been a great one for our family and I hope it may work for some others as well! Christmastime, for my family, has always been filled with delightful traditions. My parents were very intentional about it. Almost the entire month of December my sisters and I had something to look forward to that added to the wonder of it all. Of course traditions changed over time depending on circumstances, but the one that never changed was that we’d all decorate our tree together. Every single year. Something about this one thing was so joyful that we sacrificed it for absolutely nothing. Dad would start with draping the lights while Mom collected some freshly made Christmas cookies on one of her pretty Christmas plates. My middle sister, Leah, would get the music going, and I made hot chocolate (once I was old enough and had discovered my undying love for all things chocolate). We’d all open up the tins Mom stored the decorations in, turn up Amy Grant’s Home for Christmas album in surround sound, and hang ornaments to “Rockin’ Around the Christmas Tree”, dancing and singing at the top of our lungs. (We have many a home video to prove it.) Sister drama was always put on hold that night. Nothing could keep us from having fun with Leah donning a giant Rudolph red nose and my youngest sister, Lana, re-enacting an ice skating routine to “Breath of Heaven”. As my sisters and I became adults, moved out, got married, etc., many of our years-long traditions were no longer possible, but we were still unwilling to give up the tree decorating. The only problem was, we had more than one tree to decorate! Brainstorming in the ornament aisles at Hobby Lobby, Leah and I founded a new favorite tradition: the progressive tree decorating night. There are three houses between us (locally), so we kick off the evening at one house where we have some sort of appetizer and decorate the tree. Then we all migrate to the next house, where we have dinner (usually soup–something that can be prepared ahead and is quick to eat and not super expensive) and decorate the tree. Lastly, we end at the final home for cookies and hot chocolate, and–you guessed it!–decorate the tree. All with Amy Grant playing in the background, mind you. For a couple of years we even threw in an extra step where we each brought a new ornament to hang on each tree. The family hosting would open their new ornaments and those would be the first to go on the tree. Not always conducive to budgets and time, but so fun (particularly for those of us who claim the love language of gifts) if you can do it. Now, does this get complicated when you start throwing toddlers and infants with their bedtimes and endless needs into the mix? Yes. So it doesn’t always work exactly like this, which is totally fine. But if you can make it work despite all that, it’s a total blast. I highly recommend it! Give it a try and let me know what you think! Is there anything you’d do differently?